Sound Mo(ve)ments events are unique Sound Meditation experiences inspired by one particular work of art or exhibition in a given museum, gallery or cultural institution. In partnership with the artist or institution, we curate a meaningful experiences through the meditation of art. 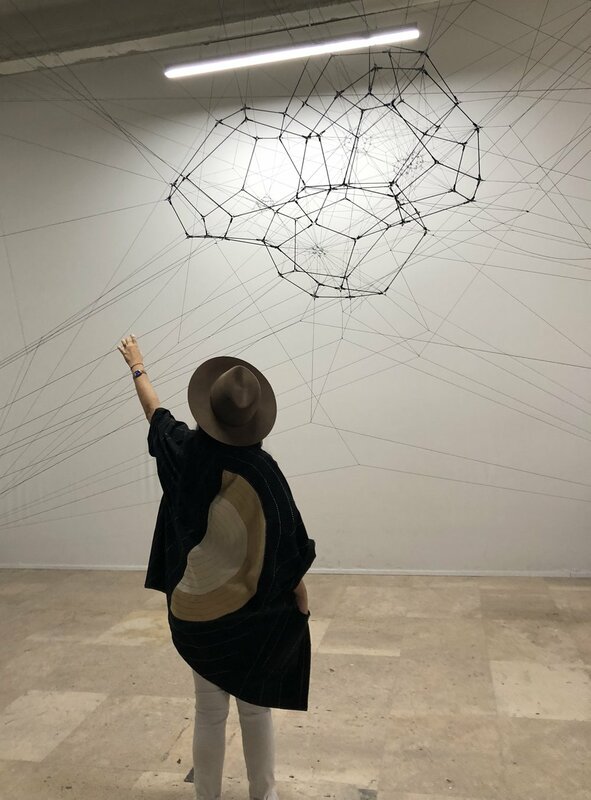 The goal is to create a multi-sensory mindful experience to facilitate a deeper and more intimate relationship with the work, bringing a greater understanding of the work and artist as well as a strong sense of human connection among participants/viewers. w/ Molly Gochman at FotoFest 2018 in Houston, Texas. Water. The main constituent of all the earth’s living organisms. The Tao Te Jing states, “The highest excellence is like that of water. There is nothing in the world more soft and weak than water. And yet for attacking things that are firm and strong, there is nothing that can take precedence of it — for there is nothing so equal.” The exhibition, Drenched, combines three series by Molly Gochman: Before (2018), Waterfalls Wept (2008) and Surrogates (2008). Together, they seek to explore, in the context of both Houston and India, ways water works to nourish and protect as well as to penetrate and devour. Sara facilitated two 30 minute experiences in the gallery space to celebrate the opening day. FotoFest 2018 Biennial ran from March 10 to April 22 in participating art spaces across the city, and Molly’s exhibit included original recorded sound accompaniment by Sara Auster. w/ Wes Sam-Bruce at Mass MoCA in May 2018, North Adams, Massachusetts. Cavernous is the third component of Kidspace’s Art 4 Change, a four-year project that explores problem-solving through empathy, optimism, and courage. The guiding principle for these exhibition projects is Albert Einstein’s statement that “[We] cannot solve our problems with the same thinking we used when we created them.” In other words, without empathy, hope, and courage, societal problems can seem overwhelming. In an era of narcissism and cynicism, therefore, an experience with Sam-Bruce’s work provides the opportunity to strengthen our collective sense of bravery, tolerance, and kindness. In Cavernous: The Inner Life of Courage, artist Wes Sam-Bruce uses the Hoosac Tunnel as a metaphor for brave endeavors. Kidspace explores what it takes to be courageous and persevere in the face of mountain-sized obstacles. Gallery visitors are invited to play in a tunnel-like structure built specifically for the museum. w/ AlexiAndrea Borden at White Space Chelsea, June 2018, New York, New York. A visual and aural journey to the Poles in AlexiAndrea Borden’s hauntingly beautiful exhibition of large scale photographs of icebergs. 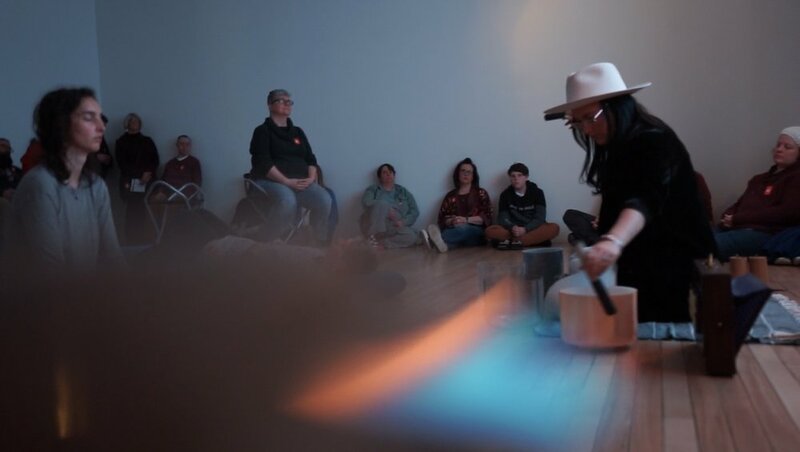 In the Blue Ice Skylight Gallery featuring panoramic views of a Blue Ice Glacial Wall, Sara Auster facilitating three short sound experiences to bring participants into a deeper connection with the ice. Icebergs contain pristine 12,000 year old or older water ~ what is locked within?Icebergs can float across the sea for years and present challenges and opportunities to Arctic communities, the northern and southern ends of our Earth, and even deserts and islands far from Icebergs‘ source. The photographer and a climate scientist were on hand to speak and answer questions about icebergs and their journey from our distant past into the present.